After looking through a recent issue of ANALOG Computing, I decided to buy it. When I got it home and looked through it some more, I ordered a subscription. I like Robin Sherer's Master Memory Map. I also like Craig Patchett's column, Game Design Workshop. I don't think, however, that Craig should assume that I "already know the basic techniques involved in player/missile graphics, redefining the character set, display lists, and so forth." I don't. In fact, that was one of the reasons for my not buying your magazine sooner. The articles in past ANALOG magazines assumed that there weren't any beginners out here, only advanced computer wizards. I purchased this magazine and ordered a subscription because it now looks like some help for beginners is going to be offered in your magazine in the coming months. Until I purchase a MAC/65 assembler or an Action! cartridge, I hope to see more BASIC programs in your magazine. As the above products are expensive, it may be some time before I can get them all. I hope you will continue to support beginners, as well as computer wizards. I can always cancel my subscription if you don't. Thanks for your subscription, Michael, and we hope that you will find the information you need in future issues of ANALOG. Yes, Game Design Workshop is slanted toward people with some programming experience, although we believe that the information Craig has been presenting each month is complete enough to teach you the basics involved in writing a game, even if you haven't encountered some of the techniques before. However, GDW is not a tutorial in BASIC programming. You must be familiar with BASIC to understand the concepts presented. One of the stumbling blocks of putting out a magazine like ANALOG for so many years is that you run out of topics. I doubt there is a single feature of the Atari 8-bit computers that hasn't been covered in depth sometime in the pages of ANALOG. Such basic programming techniques as redefining character sets, modifying display lists, performing page flipping and accessing player/missile graphics have all been covered in the past. However, we realize that there are a lot of new Atari owners out there who haven't yet explored the potentials of their machines. In recognition of this fact, we are perfectly willing-if there are enough people interested-to cover these topics again. So we must ask a favor of all our readers. Please fill out the short questionnaire found in this issue so that we can accurately assess the direction that we should take ANALOG in the future. 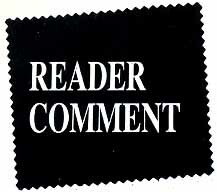 This is your chance to tell us how you feel about the current ANALOG and what, if anything, we should do to change it. Please take a couple of moments to respond. Thanks.